"You called for a hero, princess?" "Yes! But, I guess you'll have to do." "Why must everything you say to me sound like a criticism?" Snarky loser hero meets snarky haughty heroine. They either fall in love, or they snark. Usually both. This is essentially a satire of the standard Magical Girlfriend, which describes a beautiful, classy, good-mannered, loyal girl—the logical result being she should be somewhat critical of her loser boyfriend. She makes no attempt to ignore the fact that he is the Loser Protagonist, and frequently calls him on it, criticizes him, and rarely if ever fawns over him like some Fangirl. She expects better from him and pushes him to improve, while still expecting to be taken care of. However, the guy usually takes it in stride, mocks her in return, or just says the trope title. Expect a generous helping of Aww, Look! They Really Do Love Each Other moments, to let the audience know why they should be supporting this couple. The idea is that the snarky loser will help the princess loosen up and be friendlier, while the princess constantly holding the loser to a higher standard will eventually make him improve himself. Often appears in Love Comedies, depending on how satirical the story is. See also Tsundere. Related to Belligerent Sexual Tension. Compare/Contrast Screw You, Elves! and Surrounded by Idiots. If it involves an actual Princess Princess, see Royal Brat. The Woman Wearing the Queenly Mask can make similar demands. 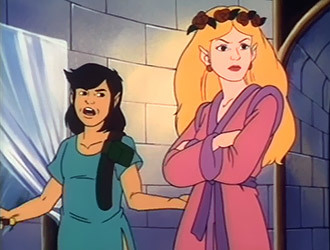 The trope name comes from the The Legend of Zelda cartoon, where Link would quite often retort to Zelda's nagging with those words.note The line, including Link's delivery of it (but excluding "princess"), is heavily inspired by comedian Steve Martin. True to a degree of Asuka and Shinji's relationship in Neon Genesis Evangelion. Asuka is often quite the Jerkass towards Shinji, but it is clear at least some of her meanness stems from the fact that she is attracted to him (not that she would ever admit it), but views his passiveness, social ineptitude, and tendency to apologise a lot as undesirable traits. It doesn't help that she views their guardian, Misato, as enabling these traits in Shinji by often telling him that he is good enough as he is. Shinku in Rozen Maiden, partly because she believes Jun is her servant, partly because she has the attitude of an Ojou and Jun is a Hikikomori. Ai Amano of Video Girl Ai twists this trope in that she acted like this despite not being supposed to be the "princess" or girlfriend, but still fell for the lovable loser Youta, whom she was trying to improve. The Goddess Pandora, the "heroine" of the manga Because I'M the Goddess!, has that kind of attitude in her dealings with Aoi. Nagi and Princess Arika in Mahou Sensei Negima!, with some serious slaps thrown in for his uppitiness. He was kind of asking for them. William and Miyako in Private Prince genderflip this, as he is the prince and she's the commoner with low patience. Louie and Melissa in Rune Soldier Louie, as Melissa constantly criticizes Louie and tries to turn him into a 'champion'. This sums up Kouji Kabuto and Maria Grace Fleed's relationship in UFO Robo Grendizer, which might be one of the (if not the) earliest examples in anime. Considering that Koji is being himself, Maria's behavior is understandable. In My Teen Romantic Comedy SNAFU, its a notable element of the chemistry between Hachiman Hikigaya and Yukino Yukinoshita. Although compared to the average person, it's debatable if Hachiman is a loser. Still with Hachiman compared to Yukino this trope is likely to apply. Yukino is described as incredibly beautiful, a strong first academically and, in Hachiman's words (LN), the "epitome of nobility". On the other hand, Hachiman is described as having an unpleasant appearance, academically variable at best and socially awkward. Sayoko from Tentai Senshi Sunred is the girlfriend of Sunred, an ex-sentai hero who's unemployed. Despite being the one of them not capable of punching holes in concrete and running at the speed of sound, she's the one who does everything around the house, owns their apartment and stationary, earns a steady paycheck, and (with her limited spare time) tries to get Sunred to apply himself. In Touch, Minami constantly criticizes Tatsuya's laziness and immaturity and tries to coax him to give his best. This is Adam Strange's attitude towards Starfire when they're stranded in space in 52. Animal Man tries to act as a mediator. Sabretooth shows this toward Monet, with whom he shares a Belligerent Sexual Tension in UXM. The first chapter has Creed making a joke after scaring a man to the point of soiling himself. Monet says toilet humor is expected from someone of his pedigree, before asking if the enemy is impressed by his everyman wit or enamored by her awesomeness. Creed responds that nobody's as impressed by her as she is with herself. Another instance occurs during a Hellfire Club meeting. Psylocke: These people may look like elitist snobs but they'll chew you up, spit you out, and feed you to their young. Creed: Speaking of snobs, why isn't Monet with us on this? A Crown of Stars: Asuka often expresses annoyance and dissatisfaction with Shinji behaving like a wimpy pushover who will not stand up for himself, will not push back when pushed and apologises for anything when she knows he can be better than that. Shinji is not a good snarker and usually he ignores or lets her criticisms go, but sometimes he will retort. Evangelion 303: Asuka and Shinji's relationship played like this during the first chapters before getting together. She would snark and he would snark back, usually in a milder way. Or she would insist that he was now part of the elite so that he should act like it, and he would snark . Or she would be rude due to be upset, and he would snark . Princess Eilonwy in the Disney animated version of The Black Cauldron, who patronizes Taran when she learns that he's not a warrior or a lord, but an Assistant Pig Keeper. When Taran pats himself on the back for enabling their castle escape, she takes him down a few notches by reminding him not only that her knowledge of the dungeon passageways allowed him to break out of there, but that Taran's magic sword did most of the work. Jasmine of Aladdin is a plucky rebellious princess who very quick to deflate pomposity and tell those who appear interested in her only for her beauty and kingdom exactly what she thinks of them, such as Prince Ali Abahbawa (Aladdin's disguise). After his ruse is exposed and they are engaged, she continues encouraging him to act less like a street thief and more like a man who will become sultan. Tiana in The Princess and the Frog. True, Naveen is a lot more competent than he lets on - he's just lazy, which is enough to set a workaholic like her off. Han Solo's initial relationship with Princess Leia in the Star Wars films. Namely the first two, because by the third film they've softened to each other, and when they do snark, it's more in jest. For a while after Star Wars, Harrison Ford was typecast for this kind of storyline. The number of movies with the premise "Harrison Ford is forced together with haughty woman and they hate each other but eventually fall in love" is considerable. Princess: I am Princess Vespa, daughter of Roland. King of the Druids! Lone Starr: (groans) That's all we needed: a Druish princess. Barf: Funny. She doesn't look Druish. Prince of Persia: The Sands of Time with Dastan and Tamina since Dastan (as the adopted son of the King of Persia) should be higher ranked than Tamina (as princess of a smallish city state). Sure Dastan was born an urchin but after spending most of his life as a prince the interaction comes across as odd. He defers to her (when he's not selling her to bandits) because he's a gentleman, she's overbearing and holds a grudge because he is the main reason that Persia was able to conquer her small city-state. The overbearing attitude was more or less an act because she nearly escapes (and kills) Dastan because of it. The Wizard: Corey and Haley follow this trope to the tee. He even compares her to Zelda (someone who always needs to be rescued and is the Trope Namer) and she takes that as sexist. In David Eddings' The Belgariad, this is Garion and Ce'Nedra's relationship condensed down to four words. Unsurprisingly, she's pissed when she finds out that he isn't just a farm boy, but the long-lost heir to the Rivan Throne and hereditary Overlord of the West... in other words, more royal than she is. Belgarion has the foresight to find a way to make them equal in status to preserve his own sanity after the marriage. Aravis to Shasta in C. S. Lewis's The Horse and His Boy. This defines their relationship from the very beginning. Their first words to each other: "Why, you're only a girl." "And you're only a boy. A rude, common little boy. A slave probably who's stolen his master's horse!" The Lemony Narrator even jokes about this at the end, when he tells the readers that they continued to affectionately bicker and eventually decided to get married so they could continue to do so more conveniently. The relationship between Taran and Eilonwy in The Chronicles of Prydain, although the series is peppered liberally with Aww, Look! They Really Do Love Each Other moments, mitigating this somewhat. She initially found him "fascinating" for being an Assistant Pig Keeper in the original Chronicles of Prydain because she had never met an Assistant Pig Keeper before. In fact, she held a persistently casual attitude towards most everything. Though there was an element of the stated trope present, she didn't judge him less for his station. Except when she is Brainwashed and Crazy. Lloyd Alexander seems to have liked this trope, as we also see it from Joy-in-the-Dance toward Lucian in The Arkadians. The idea that her treatment of him masks romantic feelings seems absurd to him at first, but to the other characters it's obvious. Winterbourne: I wish you would flirt with me, and me only. Daisy: Ah! thank youthank you very much; you are the last man I should think of flirting with. As I have had the pleasure of informing you, you are too stiff. Winterbourne: You say that too often. Daisy: If I could have the sweet hope of making you angry, I should say it again. Marguerite Blakeney and her husband, Lord Percy Blakeney, of The Scarlet Pimpernel fame. She fell in love with him and agreed to marry him despite his foppish ways because she could sense there was some depth there. But after their marriage, those depths have apparently evaporated, and she's married to a complete airhead whose most pressing concern is fashion. (Or so she thinks...) She doesn't hold him to a high standard anymore — she just mocks him openly to their friends. Percy doesn't fight back in his own defense, because he loves her, but does not trust her. Ysabelle the squirrel maiden acts this way toward Vesper the bat during the first half of Robin Jarvis' The Oaken Throne. Their species are sworn enemies, and she finds him repulsive. He sees her as nothing but an "uppity tree worshipper". As they get to know each other, however, they fall in love. Kitai of the Codex Alera. She wanted to bond with a horse, and continues to remind Tavi at relatively regular intervals. She doesn't just look down at him for personal reasons, but also detests his species. She snarks it up with some of the best and, yes, they do eventually fall in love. She gets a Quip to Black to end out the series that doubles as this trope. It's also a mild genderflip: Tavi's royalty, Kitai's just the daughter of the head of one tribe, and her people's diplomat (appointed by Tavi). Precious Stone is this to James Bond at the start of the Young Bond novel Hurricane Gold. Arya of the Inheritance Cycle tries to do this to keep Eragon at bay, because even though he's an adult by human standards, by the standards of the semi-immortal Elves and Dragon Riders he's the youngest of kids. She's the child of the queen, groomed for leadership, her people's diplomat, a warrior, and he's a moonstruck fledgling rider who is their only hope and doesn't need the distraction. In retrospect, she's right and he's still finishing puberty. Priscilla in Henry Wadsworth Longfellow's Narrative Poem "The Courtship of Miles Standish". Her snarky, "Why don't you speak for yourself, John?" has even achieved meme status. Canderous refers to Bastila specifically as "You spoiled little Jedi princess." Because of this, Canderous/Bastila is an ascended Crack Ship, popularized when a fanfic writer (who writes romance novels professionally) took a whack at it . In The Witchlands, Safi is rather more elegant and aristocratic, whereas Merik is a sailor, so when they're not fighting or kissing, this contrast in sophistication causes squabbling. Robin notes that everything Marian says to him sounds like a criticism. Allan-a-Dale's priceless reaction ◊ to Kate snapping: "My NAME is KATE!" by way of an introduction. His expression qualifies. Buffy the Vampire Slayer: Both of Xander Harris' girlfriends, Cordelia and Anya, had a strong tendency in this direction given his general loserness yet competency in helping with the supernatural nasties. By the time he's going with Anya, he's more competent at arguing back, and so the trope is lampshaded in dialogue. Kaitama the First Monarch in the Star Trek: Enterprise episode "Precious Cargo". She starts off as a kidnapping victim Girl in a Box. When she is removed by Trip Tucker, she spends the episode being this to him while they escape from the kidnappers, leading to the inevitable squabbling, torn clothing, and passionate clinching. Cheers: Diane often acts like this, much to Sam's chagrin. Most of their clashes tend to stem from Diane needling Sam for his Book Dumb status—and his typical predilection for women that Diane deems airheads/floozies. Diane: You're a rapidly aging adolescent! Sam: Well, I would rather be that than a snob! Diane: And I would rather be a snob. Sam: Well, good!—because you are! Caleb and Hanna from Pretty Little Liars dynamic as a couple fit this trope at the beginning of their relationship. Caleb even calls her "princess". She thinks it's pretty hilarious. On Schitt's Creek, Fallen Princess socialite Alexis Rose spends the first season annoying/attracting hunky granola guy, Mutt Schitt. Bickering and eventual kissing ensues. Roxane of Cyrano de Bergerac is an intellectual who needs a guy with eloquence and creative genius, and if you can't deliver, she'll show you the door. Serra from Fire Emblem: Blazing Sword, who is very similar to Clarine, but is actually quite more straightforward and blunt. She's also not a noblewoman, her personality stems more from years of loneliness and Parental Abandonment. Fire Emblem Awakening has Maribelle, the daughter of a count and the local Lonely Rich Kid. She has a good heart and quite the pride, so several of her supports are made of this. Specially those with Lon'qu. The eponymous Prince of Persia (in his 3-D incarnations) has this sort of a relationship with the various female sidekicks he works with. Farah: WHY DID YOU PUT YOUR SWORD AWAY?! Almost every girl Jimmy from Bully takes interest in, with the exception of Zoe, though she is definitely snarky. The Legend of Zelda: Twilight Princess: Link always makes a face at Midna and even growls at her as a wolf. It crosses into Vitriolic Best Buds later in the game. The Legend of Zelda: Ocarina of Time: Princess Ruto starts berating Link as soon as they meet, and forces him to literally carry her out of Jabu-Jabu's belly. Then she gets both huffy and blushy about how the Third Elemental Stone is also the Zora Engagement Ring. The Legend of Zelda: Breath of the Wild: This incarnation of Zelda is much like her cartoon counterpart, being aloof and haughty towards Link with a dose of Inferiority Superiority Complex replacing the snark. This is for two reasons. First, Link was assigned to be her guard and knight and was ordered to stay at her side at all times, and Zelda views herself as independent enough to not need someone to protect her. Second, she is (at first) unable to tap into the power of her Royal bloodline while Link was able to tap into the powers of the Hero incarnation much sooner than her. To her eyes, Link was a constant reminder of her failures. After Link saves her from Yiga ninjas, she has a Jerkass Realization and warms up to him. Blazblue: Rachel Alucard is a firm believer of Tough Love it seems, and acts out this trope towards the entire cast, but especially Ragna the Bloodedge. There is almost no conversation between the two that doesn't devolve into Snark-to-Snark Combat. While Rachel does care about him, she absolutely refuses to admit to such and implying she does is a Berserk Button for her. For his part, Ragna does have a few issues he needs to get over as well. In Lost Horizon, Kim isn't as impressed with Fenton as he is with himself, often snarking at his unusual strategies and complaining about the problems she's had as a result of leaving Hong Kong with him. He, for his part, keeps trying to offload her as if she's a helpless liability. They get together in the end anyway. Amaltea from Sword Princess Amaltea sometimes gets in troubles for being so arrogant and Ossian has to call her out. The Trope Namer is Link in The Legend of Zelda cartoon, in his most lackadaisical and snarky iteration. Zelda was a good mix of both this and the Magical Girlfriend tropes, preventing him from getting too full of himself for being Hyrule's champion or lazing about. Kim Possible attempting to fix best friend Ron Stoppable. Considering how pathetic he was through Season 1 and 2, she didn't go far enough. Kim: Last night he had to take off his shoes to count to 12; now he's taking a genius aptitude test. Thomas the Tank Engine was likely thinking this exact quote when Emily began trying to "advise" him in one episode. Then there was that time she took over Gordon's express and began throwing her weight around. Not to mention that one time when she visited an old castle and proclaimed her Queen Emily. Deconstructed: Eska treats Bolin like a flunky, and he quickly wants out. And then, she tries to force him to marry her. By the end of the season, it turns out Bolin really did love her, but her insanely overbearing, borderline sociopathic ways terrified him (as they did everyone but her own brother and father). She really did love him too, in her own... unique way. After some character development and both coming to terms with their own issues and each others', it looks like they can be together happily... Except now the twins have to go back to the North Pole to explain to their mother what a mess their father made. Daria: Daria's parents play this completely straight. Helen often gets frustrated with Jake and isn't afraid to lampshade how ridiculous he's acting; he in turn isn't afraid to snark at her or voice his frustration; they make out soon, however. It's even lampshaded by Helen's sister Amy, who congratulates Jake for putting up with someone as "high manteinance" as Helen. That did sound a bit douchey.